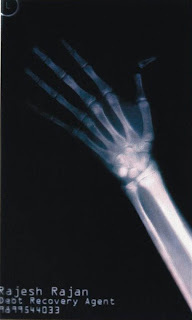 A business card for a debt recovery agent on an X-ray film of a broken finger, in India (direct daily). I am collecting business cards (virtual and real) and will be posting them as more come in, but if you know of a good one, please drop me a line. Also see concept cards by Ideo, for a divorce lawyer, for a dentist, and made of lock picks.